Looking for tips on how to feed your cattle during a drought? Are your hay supplies adequate during this dry season? Want to estimate your cattle rate-of-grain? Interested in alternative feeds for fall? Click here to read our Fall Feed Guide from Purina. WASHINGTON — The Agriculture Department said Friday that consumers could still expect higher food prices next year, but the expected 3 percent to 4 percent increase was unchanged from last month, even as extreme heat in the Farm Belt continued to reduce the grain harvest and increase feed prices for livestock. “The data out this morning shows that nothing much has changed,” said Ephraim Leibtag, deputy director of research at the department’s Economic Research Service. The prices of beef and veal will go up the most next year, the report said, almost entirely because of higher costs for feed, which is made from corn and other grains. Beef and veal prices are expected to increase 4 percent to 5 percent. The most immediate impact of the drought will be seen this year in poultry prices, the government predicted. Government forecasters reiterated their projection of a 3.5 percent to 4.5 percent jump in chicken and turkey prices this year. The prices are expected to rise a bit less next year, in the range of 3 percent to 4 percent, the government said. The increase in feed prices has caused many cattle producers to sell off or cull their herds. Cattle sales are up nearly 30 percent over last year, said Sara Baker, a spokeswoman for Sageworks, a financial information company based in New York that tracks the sales. The Agriculture Department said the reduction in the number of cows could result in a temporary decline in beef prices this year as a surplus of cattle is sold and more meat enters the market. Cheese and milk products are expected to rise 3.5 percent to 4.5 percent in price next year, unchanged from last month’s forecast. Egg prices will also be affected, with prices forecast to rise 3 percent to 4 percent next year. About 40 percent of the corn crop is used to feed livestock. Feed costs account for 50 percent to 70 percent of livestock and poultry production, according to the American Feed Industry Association, a trade group. A government estimate released this month said that because of worsening drought conditions, farmers would produce about 10.6 billion bushels of corn this year, down from what had been projected at the beginning of the year to be a record 15 billion bushels. The reduction in corn and soybean supplies has pushed up their prices to record levels. The Agriculture Department said this week that 85 percent of this year’s corn crop was in drought-affected areas, as was 83 percent of the soybean crop. As of Monday, just 23 percent of the corn crop was rated in good or excellent condition, while 31 percent of soybeans were rated good or excellent. An earlier version of this article misspelled the given name of a deputy director of research at the Agriculture Department. He is Ephraim, not Ephrain, Leibtag. Don’t forget to visit Eagle Hardware for for license and everything else you need before the season begins. 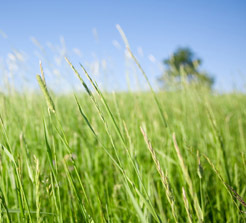 We will take orders for Rye grass seed starting on September 1. We’ll have Jumbo, Oregon, and TAM seed this year. We expect the demand to be quite high this year due to the drought. Place your order early to ensure that you receive the quantity and type of seed you want. Questions? Give us a call at 972-635-7878.